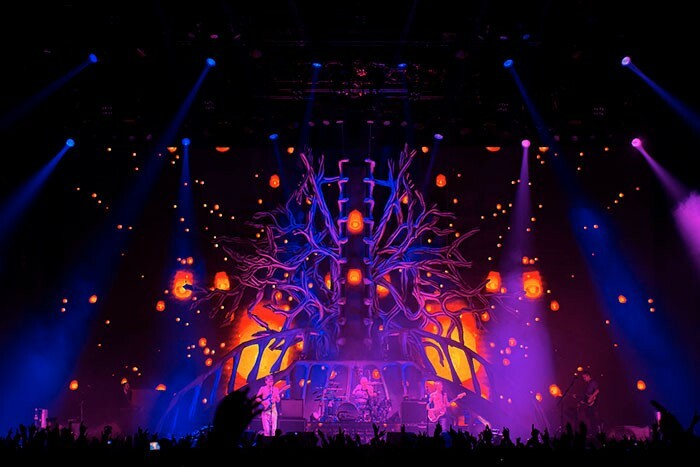 XL Video supplied full video production – including 457 tiles of Pixled F12 LED, PPU / cameras, Catalyst media servers and crew for the recent UK arena leg of Biffy Clyro’s ‘Opposites’ world tour. The Ayrshire rockers’ sixth studio album has been their first to take the Number One slot creating huge excitement! The sold out tour featured a fabulous set created by show designer / director Misty Buckley, an intricate tree-like structure at first glance which at second squint could morph into of a pair of lungs, complete with the arterial / branch complexity of both structures. This set piece also featured integral video elements. It was beautifully combined with a lighting design by Oli Metcalfe and live camera direction by Richard Shipman to form a colourful and interesting visual aesthetic and backdrop to the band’s incendiary performances which earned rave reviews. XL’s project manager Phil Mercer comments: "It was great to be working with The Production Office on this tour and with production manager Paddy Hocken who brought many fresh and invigorating ideas to the mix. The band have grown steadily, and with the success of ‘Opposites’, the tour really took on a life of its own." XL has supplied several Biffy Clyro tours in the past, but this is by far the largest and most comprehensive in terms of production. 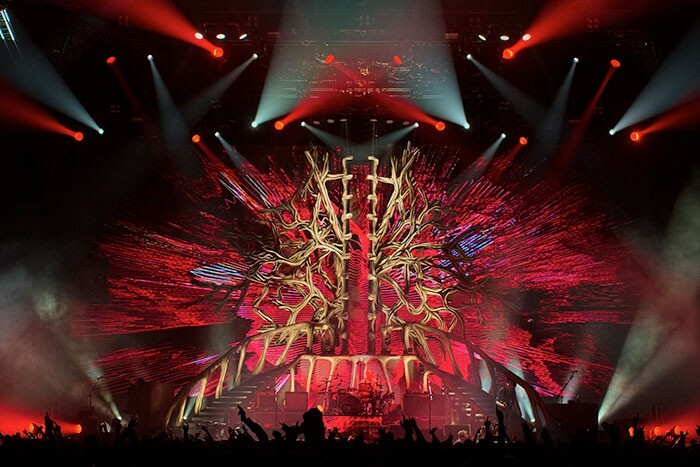 The large upstage LED screen measured 18.5 metres wide by 7.8 metres high and displayed both playback footage and the IMAG mix. In addition to this, ensconced in the set – built by Steel Monkey – was a central column of 10 x F12 tiles in the spine of the tree which also featured two sweeping staircases for entrances / exits to the platform. A riser surround and staircase forming the base of the tree was also fitted with internal F12 tiles. XL supplied four Sony HXC-100 HD camera channels which were fed into the PPU built around a Panasonic HS450 mixer / switcher. 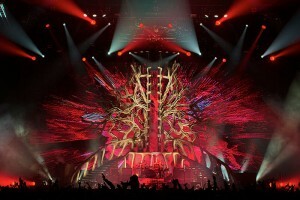 Two cameras were stationed at FOH long throw lenses, and the other two were in the pit with HJ22 wide angle lenses. Shipman also used a Thundering Jacks’ Video Dust system for additional effects. In addition to these, four Bradley CamBall2 robo-cams were dotted around the stage (operated by Paul Maddock-Jones), plus four Bradley HD10 mini-cams, all of which were fed into Shipman’s mix. For the playback footage – produced by Lydia Baker at Screen Light Design – XL supplied two Catalyst media servers which were triggered by lighting director Richard Larkum’s Road Hog Full Boar lighting console. Completing XL’s crew were engineer Dean Ruffy, crew Chief Roger Nelson and LED / camera technician Iain Rendell. Jack Banks and Robin Haddow were brought in to assist with the Catalyst programming during production rehearsals at LH2 in London ahead of the tour starting. Audio equipment was supplied by Skan and lighting by Neg Earth; like XL Video both companies have been involved in Biffy Clyro’s live work for some time.